If the State of Maryland secedes, in other words, rebels against the General Government, and desires her present mail facilities, she must raise one hundred thousand dollars per annum to supply them. She must arm and equip troops, who must be fed and clothed. She throws herself in alliance with South Carolina—a State with which she has no interest in common—declares war against Pennsylvania and New York, and for what? Why should our people be taxed ten, twenty, forty millions of dollars per annum? What are we to fight about? Who has been wronged? What grievances are to be redressed? When this government shall have been destroyed by our people, what is to be the substitute? Are we to have a monarchy or is anarchy to prevail? Before a prudent man pulls down his house with a view to reconstruction would it not be wise to provide a better house in a better location ? Or is it wisdom to pull down our house, and when the fabric is down, then begin to consult about the place where we are to shelter our heads from the coming storm? If Maryland sticks to the Union, she has twenty millions of friends; if she attaches herself to South Carolina, she has six millions of friends and an enormous debt. 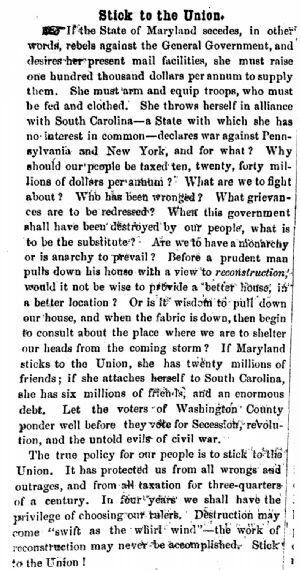 Let the voters of Washington County ponder well before they vote for Secession, revolutions, and the untold evil of civil war. The true policy for our people is to stick to the Union. It has protected us from all wrongs and outrages, and from a taxation for three-quarters of a century. In four years we shall have the privilege of choosing our rulers. Destruction may come "swift as the whirl wind"—the work of reconstruction may never be accomplished. Stick to the Union!